Noh music is made of two parts; utai (Vocal) and hayashi (music). Utai is performed by the shite and members of his school, while the hayashi is performed by hayashi-kata (musicians). While the shite or waki sing to move the story forward, the ji-utai (chorus) sing as an accompaniment to the dance or sometimes for the inner thoughts of the shite. They can also sing in the first person, as the shite, in response to questions from the waki, however, they themselves are not characters in the noh. As mentioned, the ji-utai are all members of the same school as the shite. They sit in two rows on the right side of a noh stage called the ji-utai-za. In the center of the back row is the ji-gashira (lit. chorus head). It is the ji-gashira’s job to lead the chorus and make sure they are in rhythm with the hayashi. Unlike Western music, there is not a set pitch or musical scale in utai. The pitch is set by the shite and adjusted by the ji-gashira and can be said to be elastic. The group that makes up the ji-utai sings as one voice. In contrast to Western music, there are no harmonies. 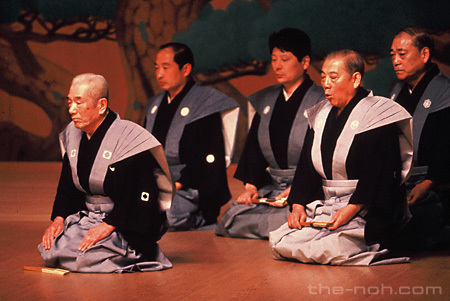 It is the role of the ji-gashira to adjust tone and be clear with the timing to control the overall feeling of the noh. Utai is generally based on a 7-5 or 12 syllable count sung over an 8 beat measure. There are three different types of hyōshi-ai (matched) rhythms in noh: hiranori or kōnori, chūnori and ōnori. Hiranori employs the standard 12 syllables over 8 beats, has the most variation and is the most complicated. 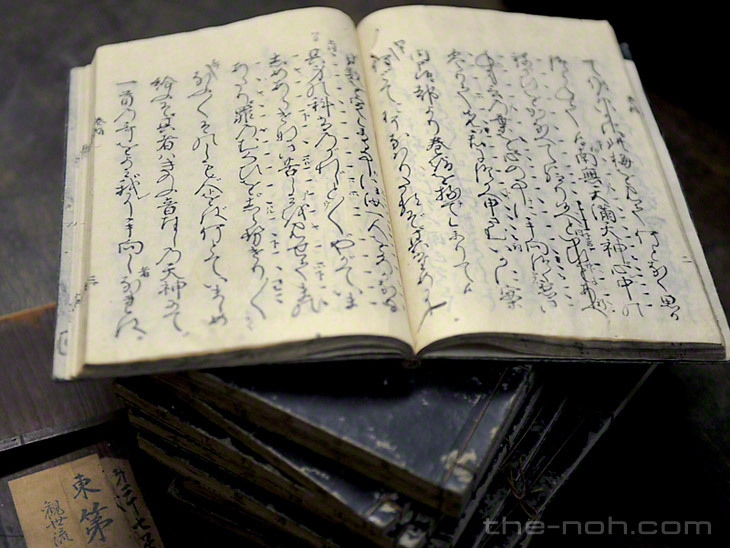 Chūnori is a rhythm in which there are two syllables for each beat and ōnori uses one syllable for one beat. In the hyōshi-awazu (unmatched) sections, the drums and the singing do not correlate with regards to beats and syllables. In terms of the singing style of utai, there are two main categories. Tsuyo-gin or gogin (lit. strong singing) is a non-pitch oriented singing style that tends to be classified as solemn and dynamic. Yowagin or just wagin (lit. weak) is a melodic singing style that can be used to express sentimentality or beauty.